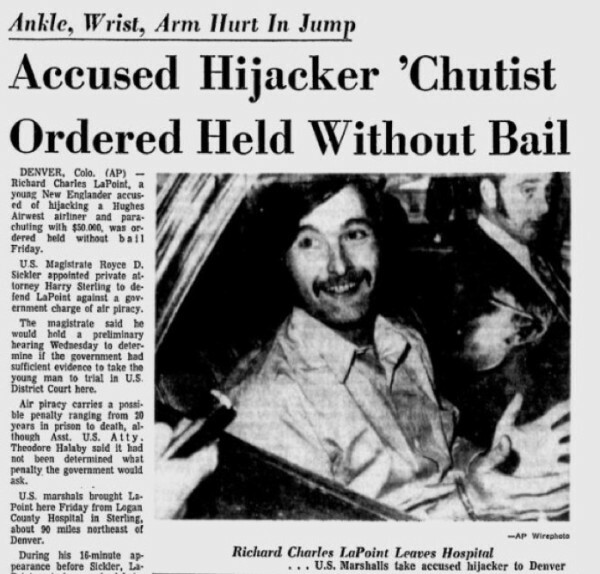 The term “Hijacking” goes back to prohibition days, when gangsters would rob moonshine trucks saying “hold your hands high, Jack!” However, in the early days of commercial air travel, the idea that someone would hijack a plane was scarcely even considered. 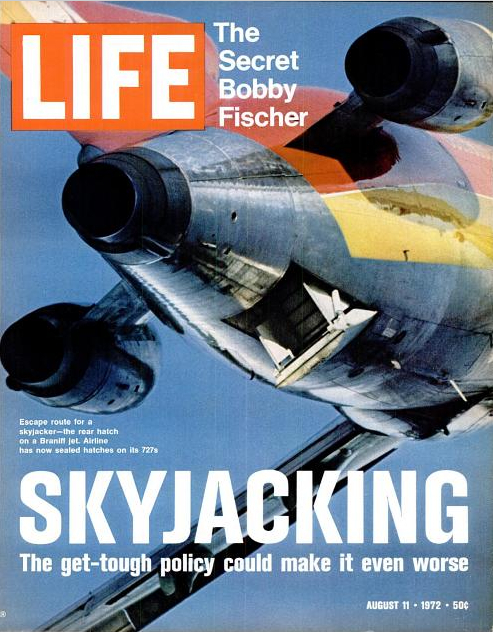 When the government started to oversee aviation in 1958, hijacking wasn’t technically a crime and the early design of airport terminals reflected this. 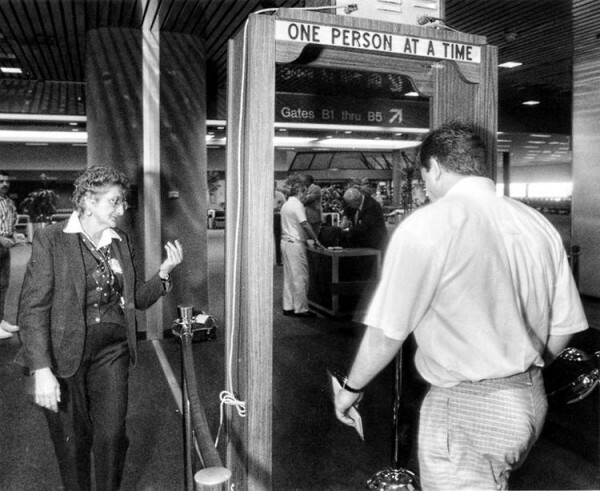 Airports were once more like train stations, where you walk through the terminal and onto the tarmac, and sometimes straight onto the plane itself, without flashing a ticket or showing anyone your identification. 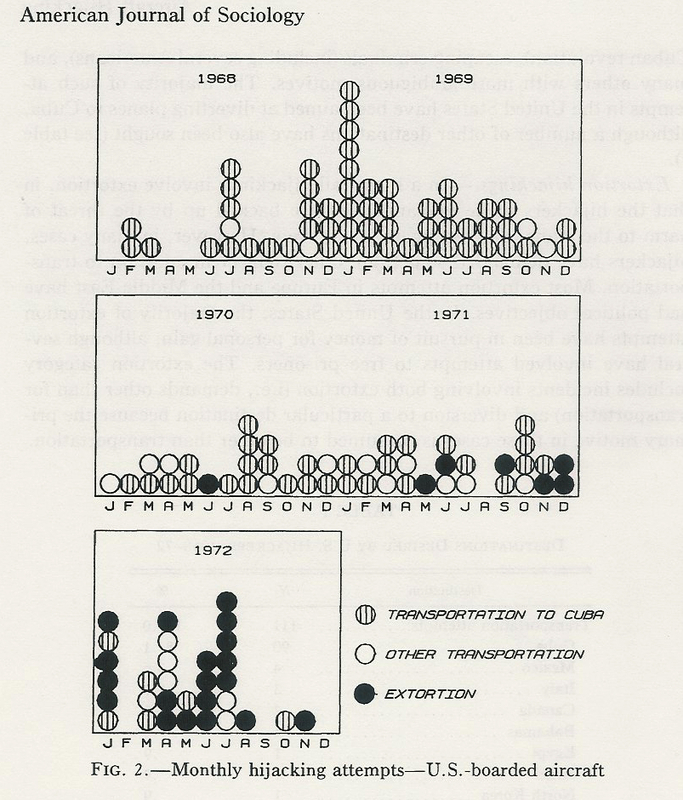 Then in 1961, an epidemic of hijackings began. 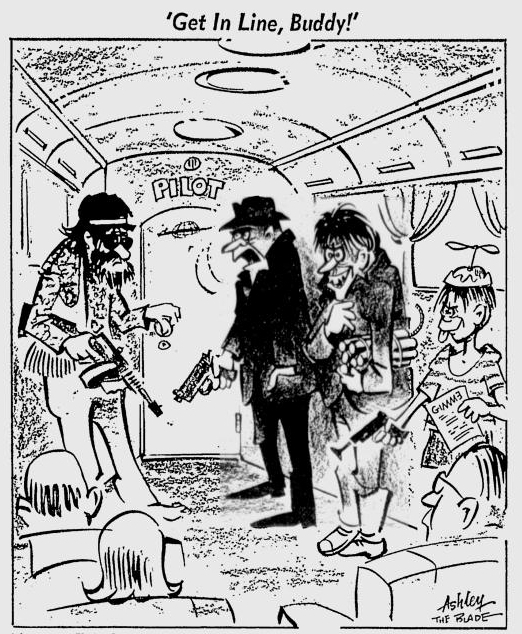 The first wave of hijackers all wanted passage to Cuba. May 1st, 1961 was the first American hijacking, perpetrated by Antulio Ramirez Ortiz, an electrician in Miami. Ramirez got on a Key West-bound flight, held a knife to the pilot’s throat, and announced that he had been hired to assassinate Fidel Castro, and wanted to go to Havana to warn him. In the second phase, the skyjackers broadened their horizons to more distant lands. There were skyjackers like Rafael Minichiello, an Italian-American marine who hijacked a plane from Los Angeles to Rome. 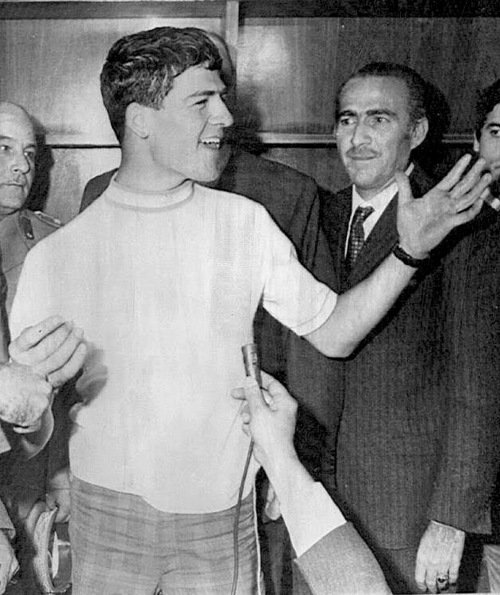 He was hailed as a hero upon landing and served only 18 months in prison because the Italians refused to extradite him. Minichiello was a good-looking guy, and actually ended up with a role in a spaghetti western film. Eventually skyjackers morphed into classic kidnappers who demanded ransom. 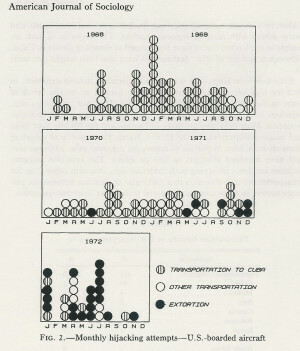 This trend was started by Arthur Gates Barkley, an unemployed truck driver who had a dispute with the IRS. Barkley hijacked a plane from Phoenix to Washington DC, where he demanded 100 million dollars in cash be given to him by the supreme court. After that, skyjackers started asking for money and gold bars and crates of liquor and cigarettes and anything their hearts desired. All the while, hijacking wasn’t considered a serious threat by airlines or passengers. It was more of an inconvenience than anything else. 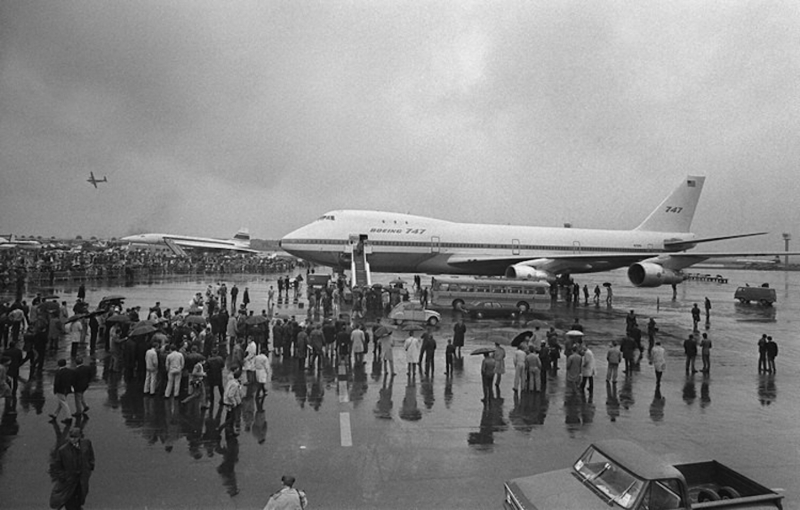 The passengers assumed that if the plane was hijacked, they would simply be flown down to Havana, where the hijacker would be taken off of the plane. Maybe they’d have to spend the night in Havana. Maybe they could catch a show and buy some cigars and rum and have a good story to tell back in the United States. Since passengers weren’t yet demanding extra security, the airlines fought to keep things exactly as they were. Security screenings would alienate customers, the airlines worried, and if they treated all their customers like criminal suspects, people would opt to drive to their destinations instead of fly. 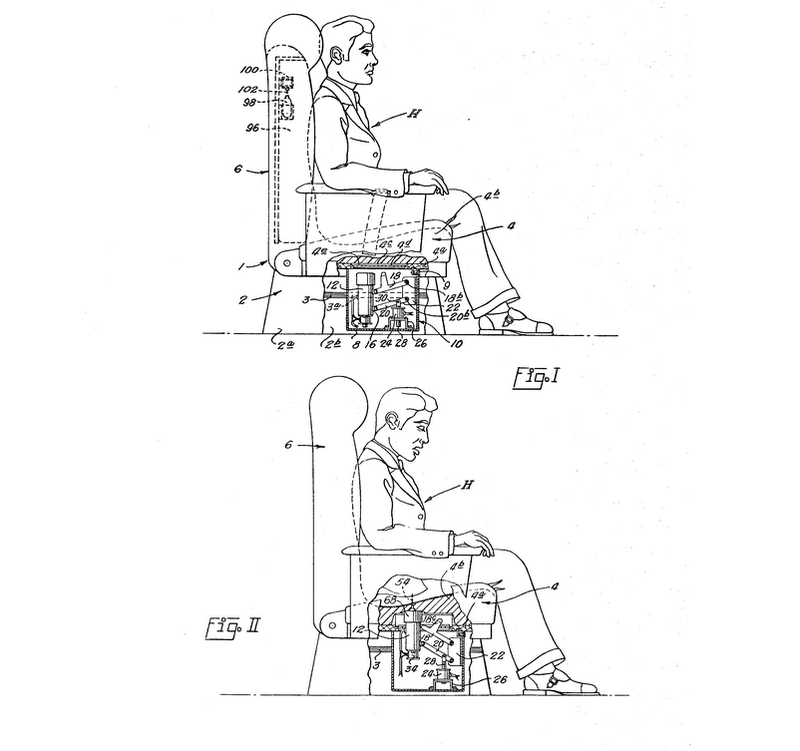 Whenever the idea of physically screening of all passengers was suggested, the airline lobby would shoot it down and force the Federal Aviation Administration (FAA) to come up with the weakest, most tepid security improvements. After all, a hijacking only cost an airline twenty or thirty thousand dollars, whereas x-ray screenings and security personnel would cost millions. For the airlines, the smart finanical choice was clear: put up with the hijackings, comply totally, and keep the customer experience on the ground the same. Still, something had to be done. 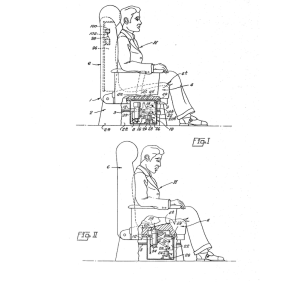 If the airlines were unwilling to consider mandatory screenings and checkpoints in the terminals, some less-intrusive solutions had to be considered. 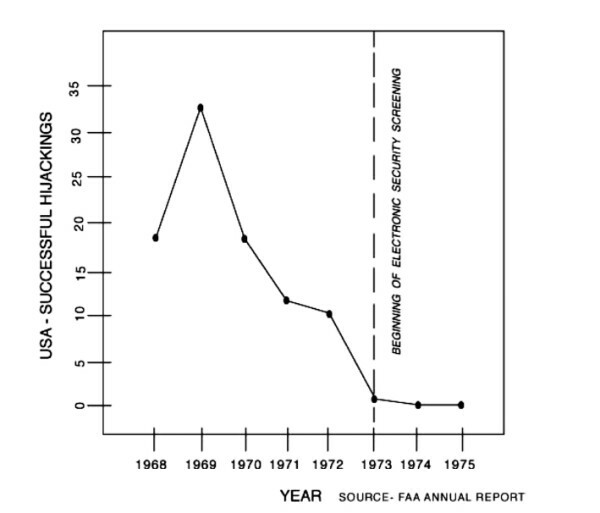 In 1968, the FAA created an anti-hijacking task-force to come up with solutions that would be palatable to the airlines. They even invited the public to submit suggestions. The most common suggestion was complete capitulation. The pilots should simply provide free transportation to Cuba for those persons leaving the United States. Another tactic that was seriously considered by the FAA was to build a phony Havana airport in south Florida. In this plan the hijackers would believe they were landing in Havana but when they got off the plane, they’d be arrested by U.S. agents. Alas, the fake airport, it turned out, was too expensive. Ultimately, the FAA realized that there was one place you had to stop on your way to a plane, and that was to get a boarding pass or purchase a ticket. The FAA solution therefore was to train the ticket agents in “twenty-five behavioral cues” that might indicate trouble. These were things like: “not maintaining appropriate eye contact,” “not caring about your luggage,” or “wearing military surplus gear.” If ticket-takers saw any of these behavioral traits in a customer, they would very discreetly ask that they go to a room on the side and be searched. As you can probably imagine, this solution proved to be a failure. The solution we all know they came up with — screening everybody and their luggage with x-ray machines and requiring ID — wasn’t seriously considered until one hijacking changed everything. 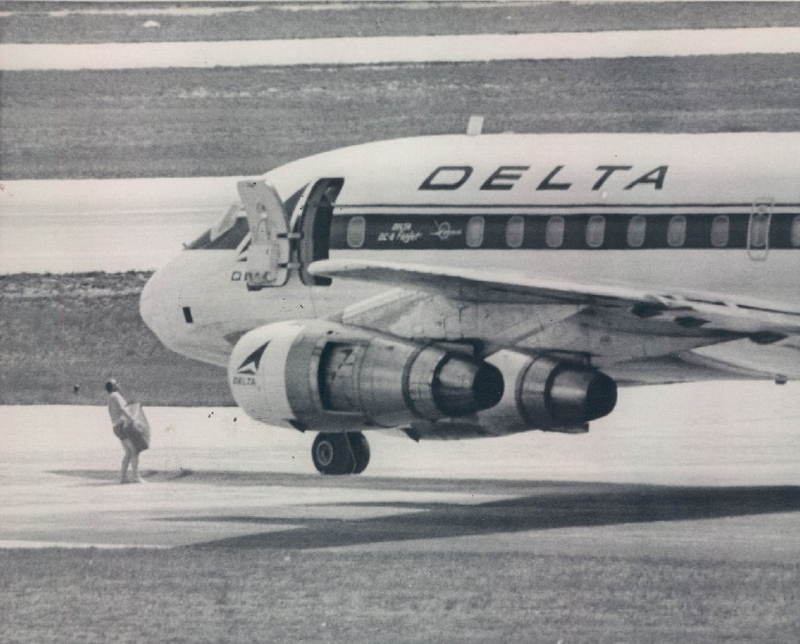 In November 1972, three fugitives hijacked Southern Airways Flight 49. They wanted ten million dollars and threatened to crash the plane into the Oakridge National Laboratory near Knoxville, Tennessee if they didn’t get it. At the heart of that laboratory is a uranium 235 reactor; all of a sudden, everyone realized that an airplane could be a weapon of mass destruction. Southern Airways didn’t have ten million dollars, but they delivered two million to the hijackers when they landed in Tennessee. The hijackers, who had drunk all the liquor on the plane, didn’t bother to count the money, and they flew on to Havana, where they were captured by Cuban authorities. Crisis averted. 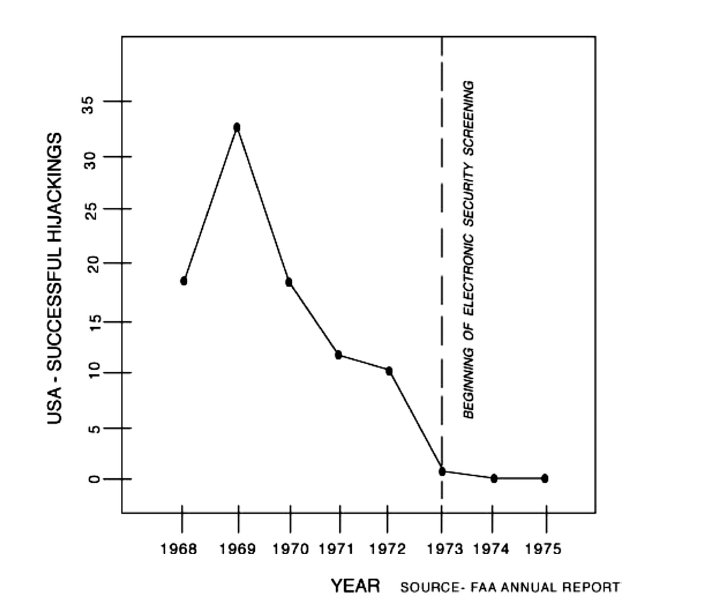 But the hijacking was a wakeup call for the airlines and the government. Shortly thereafter, on January 5th, 1973, came the mandated order for universal physical screening. Much to the airlines dismay, the screenings were to be carried out by private contractors that they would hire. 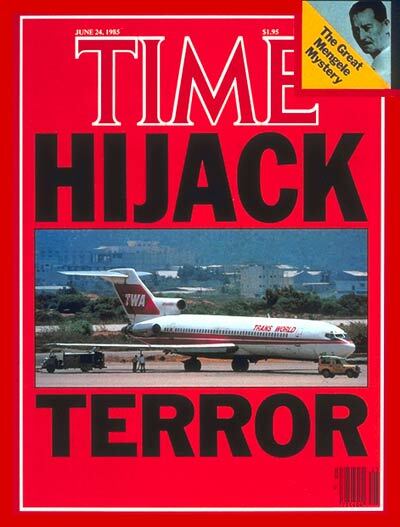 The public conception of the hijacker changed dramatically in the 80s, in specific response to the TWA hijacking in 1985. All of a sudden hijacking was associated with Islamic terrorism. 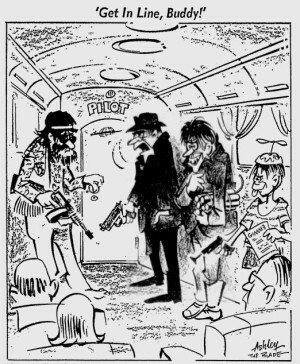 Once we had the famous image of the pilot with a gun to his head, leaning out of the cockpit, we completely forgot about the more quaint hijackers who just wanted some money and a free trip to Havana and began to think of hijackers as terrorists. Of course, 9/11 furthered the image of hijacker as terrorist, and the airplane as a weapon of mass destruction. After 9/11 the U.S. government formed the Transportation Safety Administration (TSA) and took over job of screening passengers before flights. What’s the piece of marimba music used at the beginning of this episode? The folk etymology given for hijack is – obviously – wrong, since folk etymologies always are. Care to look up the real origin, Roman? You could just check your mail. Thanks for this episode. I really enjoyed it! 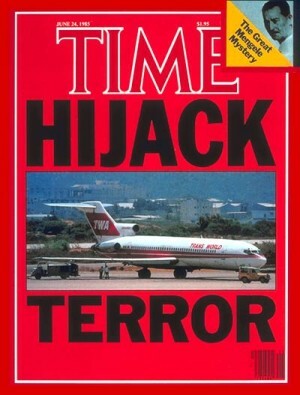 Thanks to the Israeli’s for inventing hijacking as terrorism. can’t print… i see you have a donate button… i would probably use this site heaps, the articles and production are great… but if i can’t print i can’t save, if i can’t save, i can’t cite or refer… so i won’t be back much… can you fix this? save as pdf would be ideal.